Over the course of a stellar career that has spanned more than 30 years, saxophonist Kenny Garrett has become the preeminent alto saxophonist of his generation. Garrett has always brought a vigorous yet melodic, and truly distinctive, alto saxophone sound to each musical situation. Garrett’s latest album, Seeds From The Underground, is truly an homage to those who have inspired and influenced him, both personally and musically. This album is a powerful return for Garrett to the straight-ahead, acoustic and propulsive quartet format that showcases Garrett’s extraordinary abilities. The Boston Globe raved of Garret’s work saying he has a “generous, enthusiastic playing style that makes him a concert favorite, he has become a quintessential jazz musician who will take on any challenge, and make the result sound good.” Among many other awards, Garret is currently nominated for 2 Grammy® Awards as well as an NAACP Image Award. Cecile McLorin Salvant’s unique interpretations of unknown and scarcely recorded jazz and blues compositions have helped her win the coveted Thelonious Monk International Jazz Competition in 2010. She focuses on a theatrical portrayal of the jazz standard and composes music and lyrics which she also sings in French, her native language as well as in Spanish. Stephen Holden of The New York Times describes Cecile’s voice and personality: “Ms. Salvant has it all: perfect pitch and enunciation, a playful sense of humor, a rich and varied tonal palette, a supple sense of swing, exquisite taste in songs and phrasing, and a deep connection to lyrics.” For the 2nd consecutive year, Salvant is the voice for the Chanel’s “Chance” ad campaign. Salvant’s official debut, WomanChild, will be released in the U.S. on May 31, 2013. World-renowned drummer Kim Thompson has taught and performed in over 33 countries, in addition to playing locally in many New York City’s most prestigious jazz clubs. With many music credits to her name, including being a part of Beyoncé’s all female band; Thompson has become the CEO of her own music production company, KT Music Productions. Thompson has also collaborated with Mike Stern in the album, Who Let The Cats Out?, which was nominated for a 2006 Grammy Award. In 2010, Thompson released her debut album, Like Clockwork, which features 33 songs written and produced by the drummer herself. Alto saxophonist Jaleel Shaw has quickly risen to become one of the premiere Jazz musicians today. The New York Times says Mr.Shaw’s music showcases his “stout, self-assured alto saxophone playing and his smartly conceived original compositions, without the taint of commercial pressure.” In 2005, Shaw joined world renowned drummer Roy Haynes’ Quartet and recorded the Grammy Nominated CD, Whereas, with the group. 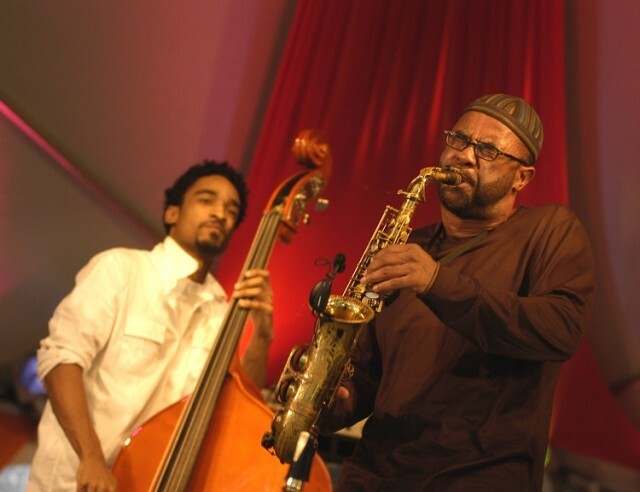 In 2008, Jaleel was nominated as one of the Up and Coming Jazz Musicians of the year by the Jazz Journalist Association. Shaw has also received two ASCAP Young Jazz Composer Awards, and in March, 2013, Shaw released his newest album, The Soundtrack of Things to Come.